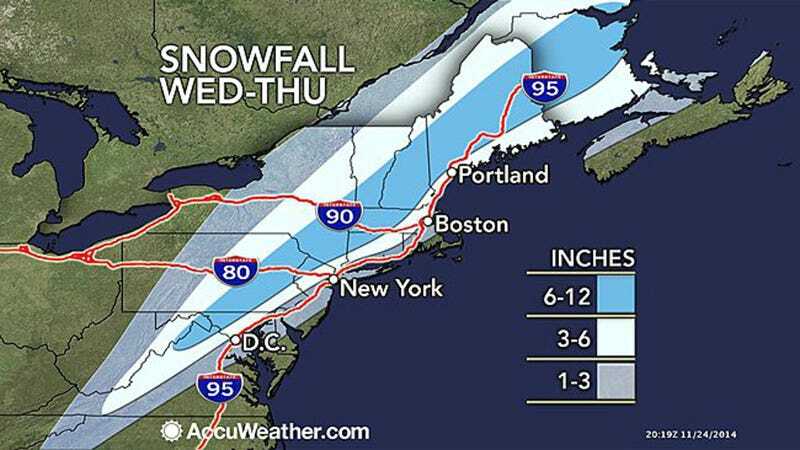 Accuweather.comSnowfall expected for Wednesday and Thursday. Thanksgiving travel is never an easy affair, what with the inevitable stress, crowds, and traffic. But this year’s holiday rush is compounded by an extra challenge from the elements: a nor’easter blowing up the East Coast Tuesday and Wednesday. Winter Storm Cato, so named by The Weather Channel, is already swirling in the Gulf of Mexico, and is expected to begin moving up the East Coast this evening, carrying rain and snow from Florida all the way up to Maine over the next few days. 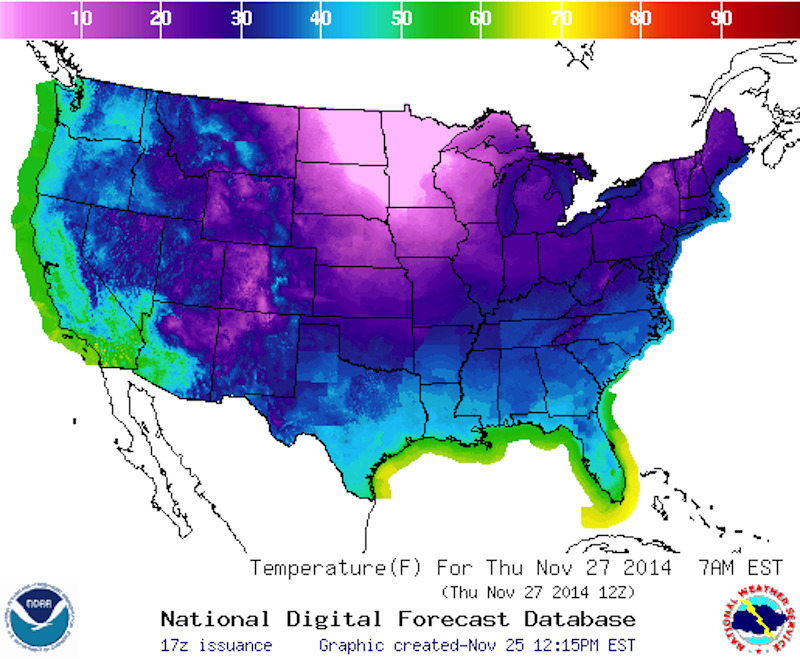 Temperatures will drop between now and Thursday. By 7 a.m. tomorrow, most coastal areas will be seeing temperatures in the 40s. By the same time on Thursday they will have dropped into the 20s and 30s for many areas, especially in New England and the mid-Atlantic. That could mean freezing roads for Thanksgiving travel. Precipitation will be the biggest factor affecting travellers’ plans. Rain and snow will also begin moving up the East Coast starting Tuesday. The gif below shows the amount of precipitation each state will receive in inches between now and Thursday evening. By 1 a.m. Wednesday morning, Southeastern states below Virginia will be the most affected. Parts of Florida are under flood warning. By midday Wednesday, the precipitation will have carried all the way up the coastline, and by 7 p.m., it will have shifted largely out of the Southeast into the Northeastern states. Conditions will begin to clear up on Thursday. Snow is one of the biggest concerns for both drivers and fliers alike. The snow will really start to set in early Wednesday morning, when it will hit western North Carolina and Virginia and begin moving north. By Wednesday evening, most of the Northeast will have been hit. Washington, DC will start getting rain early Wednesday morning — even as early as midnight — and will begin to see snow later in the morning. The snow is expected to keep up intermittently throughout the day, subsiding by late afternoon or early evening. Altogether, snow accumulation should be an inch or less. Philadelphia, Penn. will also start to see rain around midnight or shortly thereafter Wednesday morning. Snow probably won’t hit the city until late afternoon or early evening, continuing on until close to midnight. Total snow accumulation will probably be about an inch. New York, NY will get rain starting Wednesday morning. By noon, the city will start to see a wintry mix of rain and snow, which is expected to switch to full snow showers by mid-afternoon. Snow will remain likely through late evening, possibly as late as midnight. New York is expected to see 3 — 5 inches of snow Wednesday during the day, and another 1 — 2 inches in the evening. Boston, Mass. will also be hit by rain until around noon Wednesday, when it will also start to see snow, which will continue throughout the day. Snow remains a possibility throughout the night for Boston, and even into Thursday morning. The city should see 1 — 2 inches of snow Wednesday during the day, and another 2 — 4 inches in the evening.